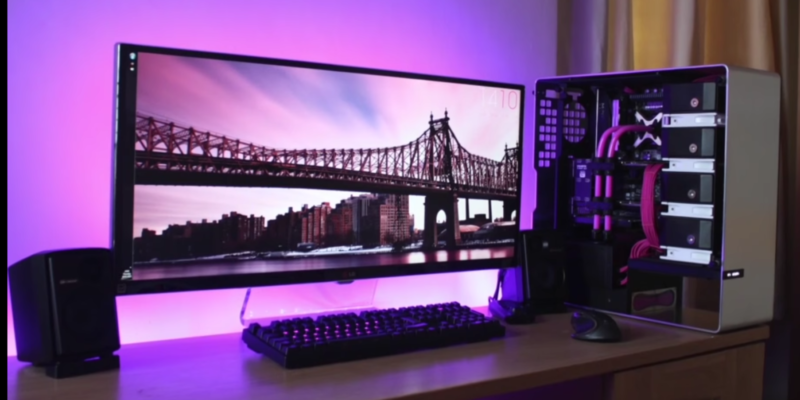 This article will discuss ways to make your setup both aesthetically pleasing and comfortable to use. 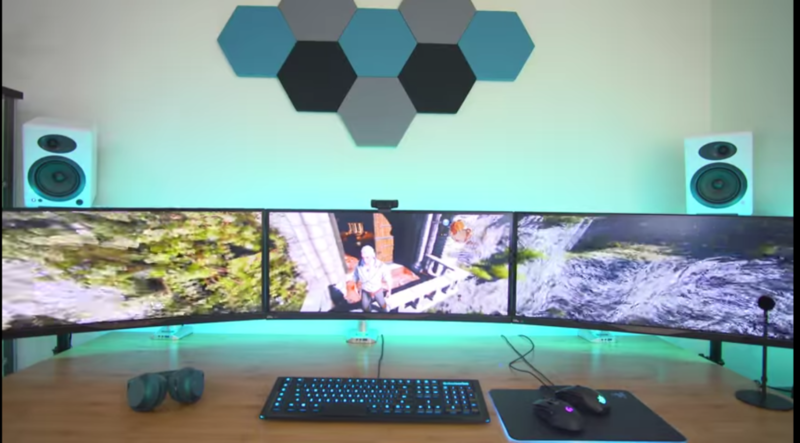 The pictures in this article are examples of great setups, although a large budget is definitely not a requirement. Symmetry – The space is filled in a balanced way. Each side of the desk has something occupying it. 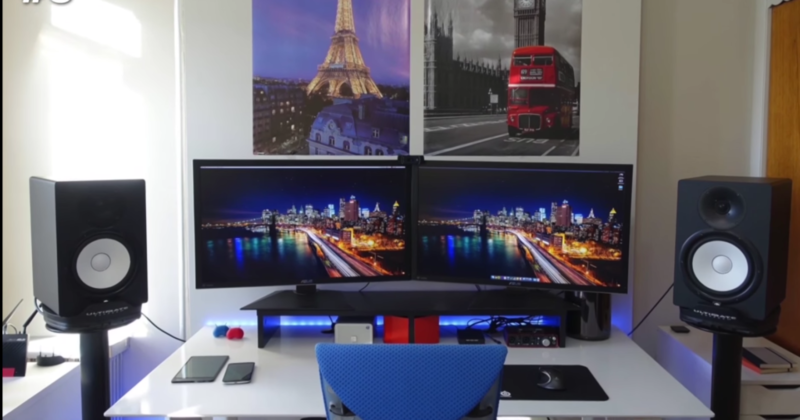 Also, if you are using only one small-medium sized monitor on a standard desk, you have wall space that can be used for something. Neatness – Cables should be tucked and organized beneath the desk. Also, keep the clutter to a minimum. Not every setup has to be ultra-minimalist, but organizing objects neatly goes a long way. Color Complements – Typically in these setups, there is a color or two that is dominant, but there are also different colors complementing as a contrast. You don’t want every object to have the same solid color (the desk should be a different color than the objects on it). Certain colors contrast very well: (i.e. blue with orange/yellow, white with almost any color). Glass desks/table are not recommended because they smudge easily, require constant cleaning, reveal cabling and hands don’t move smoothly across it. Drawers are preferable, as they help store objects to prevent clutter. Be sure to have a desk/table with an appropriate length so that there is room to move the mouse comfortably. While desks can be expensive, plenty of great furniture can be bought inexpensively from people who are moving or downsizing. You don’t need an expensive rack of manage cables. Cable ties to neaten them and Gorilla tape to adhere them behind the desk are perfectly fine. Ways of reducing cabling: Ordering shorter versions of cables you currently use (i.e. HDMI, Ethernet, Display, XLR, 2.5/3.5 mm Audio, USB), such as 2-3 feet long instead of 6 feet. Wireless keyboard and mouse also works and is recommended for those who want portability and/or home theater PC use as well, although wired keyboards and mice work fine if the cables are properly managed. 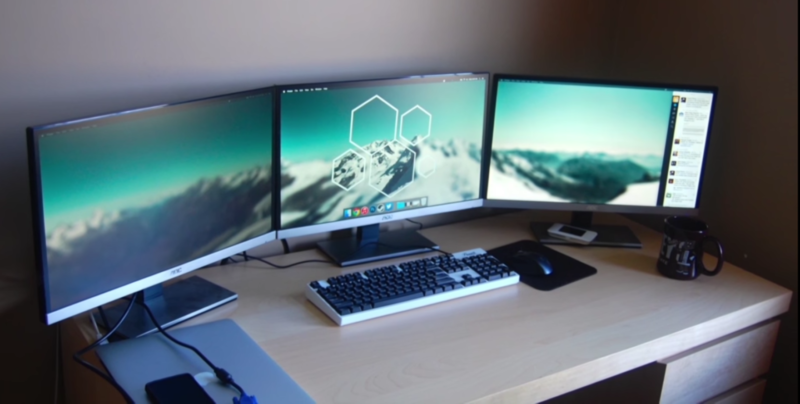 Some setups, such as the one pictured above, use a shelf of some kind under the monitor to add vertical space without reducing deskspace. Setups with headphones which need to reduce clutter can benefit from having headphones hung to the wall or hung on an adhesive hook at the side of the desk.find a way to hang their headphones on the wall (or the side of their desk) when not using them. Comfort is, perhaps, the most overlooked aspect by PC enthusiasts. Especially if your PC will be used for hours at a time. A chair with cushion and back support can make a world of a difference. I would be caution when it comes to certain “gaming” chairs which have a cool edgy automotive-like aesthetic but offer minimal support. The monitor should be at eye-level. A soft mousepad is much better for the wrist than a desk surface.